Agartala: Tripura government Tuesday sounded an alert after the death of five members of a family in Nipah virus attack in a Bangladesh village bordering West Bengal, an official said here. 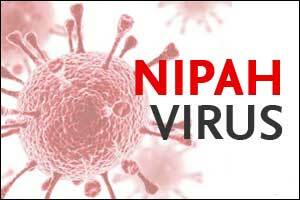 The Tripura government issued a notice to all district chief medical officers Monday to stay sensitized and alert on any impending Nipah virus attack in the state. The alert was sounded to all district chief medical officers, Joint Director of Family Welfare and Preventive Medicine Dr P Chatterjee said. “Five persons of a family died in Bangladesh due to Nipah virus attack. The deaths occurred near the West Bengal border, not the international border adjoining Tripura. Since the incident occurred in Bangladesh, the Government of India asked us to stay alert,” the official said. Nipah virus usually transmits from infected bats carrying the virus. Drinking raw date palm sap is the most common way of transmission of the virus and the health department notice advised people not to drink that sap.